Very strange. We’ve been told repeatedly that these are asylum candidates, people who had to flee their homes because their lives were at stake. And yet, according to the left-wing cable network, dozens of them have opted to return to Central America upon realizing that they wouldn’t be admittedly quickly to the United States as part of some sort of work program they’d heard about. What if, to borrow Geraldo Rivera’s Orwellian phrase, the refugees in this case are actually just “economic refugees”? I.e. 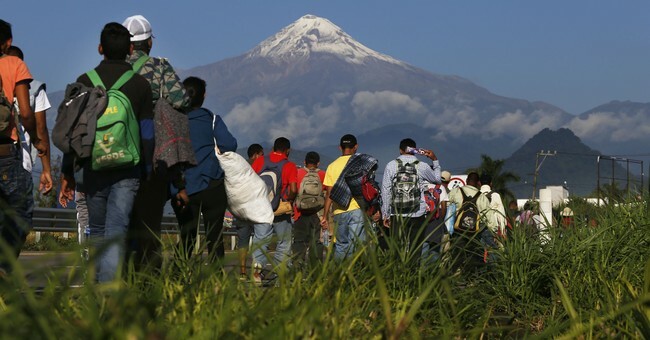 illegal immigrants, looking for nothing more than better-paying jobs and eager to game U.S. asylum laws to gain entry, after which they’ll be released while they await their asylum hearing and then never be heard from again. Tony Lee of Breitbart notes that some caravan members haven’t been shy about confessing their motives. Even migrants [Jorge] Ramos–who was given a platform on Fox News on multiple occasions to promote his pro-migrant activism–interviewed for his Facebook Watch program admitted that they are going to the United States for economic reasons. Open-borders fans like Ramos don’t want any caps on immigration, legal or otherwise, whether refugee or “economic refugee.” But caps are a fact of life, with Trump set to lower the number of refugees admitted next year to a modern annual low of 30,000. Admission to the U.S. on humanitarian grounds is a zero sum game and will remain that way even under a Democratic president, now that the center-left has seen what Merkel’s “let ’em all in” approach has done to advance nationalism in Europe. (Right, Hillary?) All that being so, why support letting “economic refugees” take spots that could go to people who legitimately do fear political or religious persecution? Why is the activist energy here being spent on Central America instead of Venezuela or Syria? Granted, they’ll meet resistance from Republicans no matter what; a president who shot to stardom three years ago promoting a global ban on entry by Muslims will be an impossible sell on Syria especially. But the case for refugee status for those people is obviously on firmer moral ground than it is for the caravan. As a purely rhetorical matter, if you want to steer public opinion towards supporting higher caps for refugees, true global disasters are the spots to focus on. Instead it’s the caravan that’s a cause celebre. Why? I think it’s because it suits both sides’ agenda, neither of which has much concern for refugees. Amnesty fans like Geraldo and Jorge Ramos aren’t concerned with asylum per se. They want the borders made porous for illegal immigrants; asylum laws are of interest to them only insofar as they provide a convenient loophole for legal status. So they promote the caravan. Trump promotes the caravan too for the opposite reason, because he knows their cases for asylum are weak and cynical. He perceives this, correctly, as a test case on whether asylum laws can be dubiously exploited as a backdoor way for illegals to gain admission. When migrants rush the border and tear gas is fired, both sides can say that the incident proves their worst fears about the other.